Handmade shell hairclips or hair clips manufacturer & wholesale. Put up this shell made hairclips to your hair. It’s a capturing-attention fashion accessory handmade product because of its distinct designs and forms compared to an ordinary hairclips made of shell wholesale. It composed of different forms such as ribbons, fishes, flowers and others. An unusual hairclips made of shell wholesale designs and shell used made this fashion hair clip collections became popular. Uniquely made of shells like mother of pear, brownlip, blacklip, paua, troca, hammer shell and many more. Code: JPSHC011 – Hairclips made of Paua shell fish design. 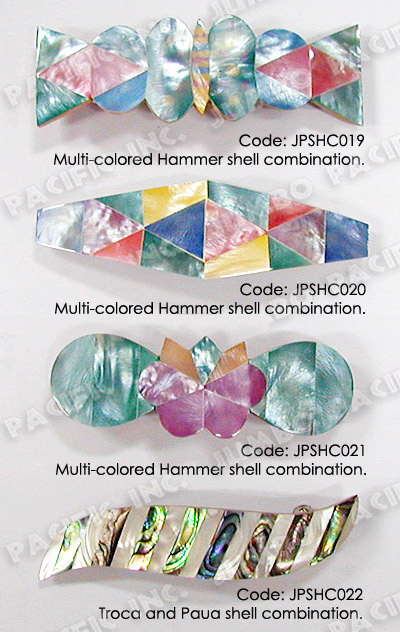 Code: JPSHC012 – Hairclips made of Multi-colored hammer shell combination. Code: JPSHC013 – Hairclips made of Paua & Troca shell combination. Code: JPSHC014 – Hairclips made of Multi-colored hammer shell combination. Code: JPSHC019 – Hairclips made of Multi-colored hammer shell combination. Code: JPSHC020 – Hairclips made of Multi-colored hammer shell combination. Code: JPSHC021 – Hairclips made of Multi-colored hammer shell combination. 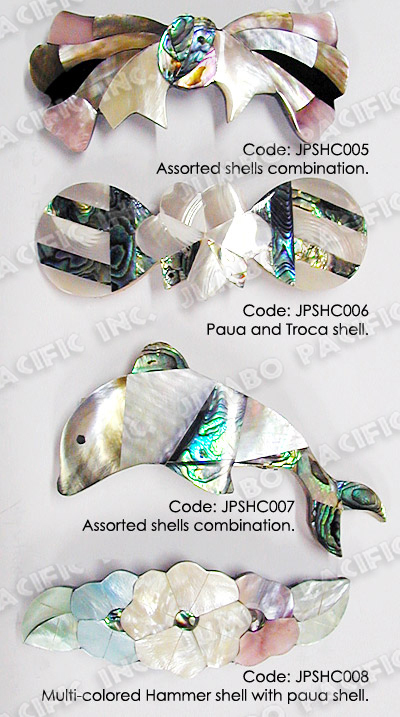 Code: JPSHC022 – Hairclips made of Troca & paua shell combination. Code: JPSHC005 – Hairclips made of assorted shell combination. Code: JPSHC006 – Hairclips made of paua & troca shell. Code: JPSHC007 – Hairclips made of assorted shell combination. 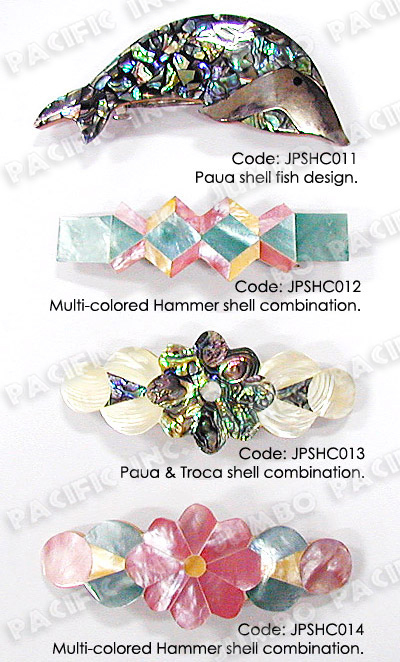 Code: JPSHC008 – Hairclips made of multi-colored hammer shell with paua shell. 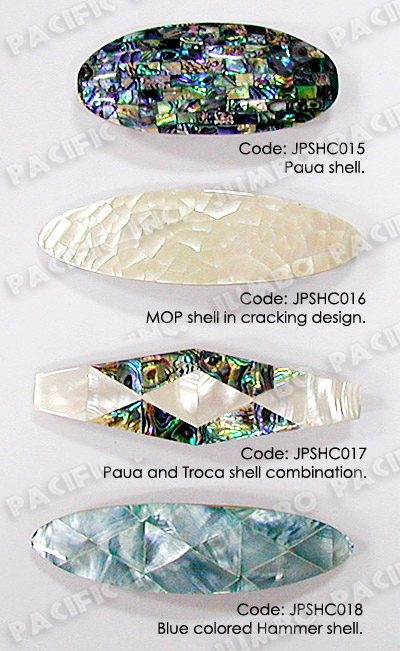 Code: JPSHC015 – Hairclips made of paua shell. Code: JPSHC016 – Hairclips made of MOP shell in cracking design. Code: JPSHC017 – Hairclips made of paua & troca shell combination. Code: JPSHC018 – Hairclips made of blue colored hammer shell. For more Handmade Fashion Hairclips made of natural components from Philippines Wholesale for export quality products.